Doxastikon of the Stichera in Tone 6. 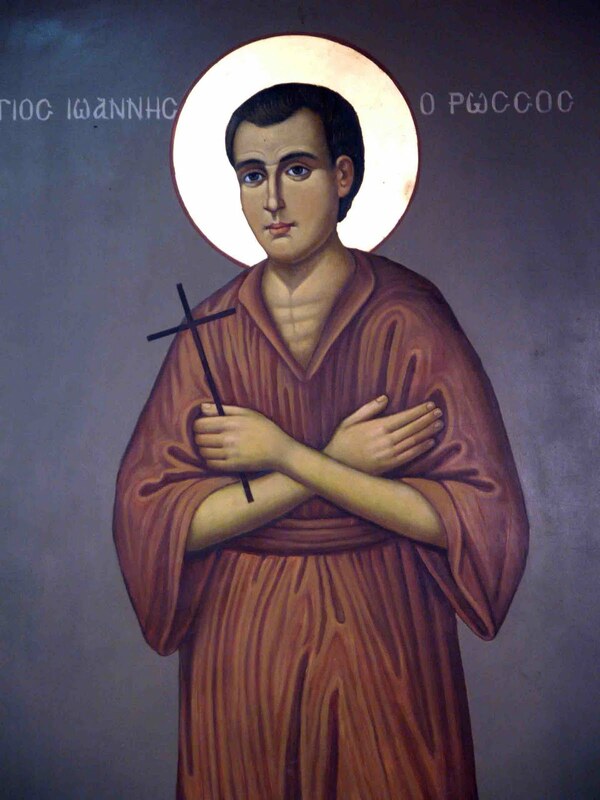 Godly choir of Martyrs, foundation of the Church, perfection of the Gospel, you have by deeds fulfilled the Saviour’s words; for in you the gates of Hell, opened against the Church, have been shut; the flow of your blood has dried up the libations poured out to idols; your slaughter has given birth the plenitude of the faithful; you have amazed the bodiless powers; bearing crowns you stand before God, whom you ceaselessly implore on behalf of our souls. Let us the faithful hasten together to the present festival; for a spiritual table and a mystical wine-bowl are set before us, filled with sweet foods of joy: the virtues of the Martyrs; for these brave-hearted ones from the ends of the earth offered to God as a rational sacrifice the many tortures of their bodily extremities and the prime of their years; some had their heads cut off, others were dismembered of hands and of every joint together; all the Saints became partakers of Christ’s sufferings. But Lord, who gave them crowns as rewards of their torments, count us worthy to live according to their example, as you love mankind. Apolytikion of the Saints. Tone 4. 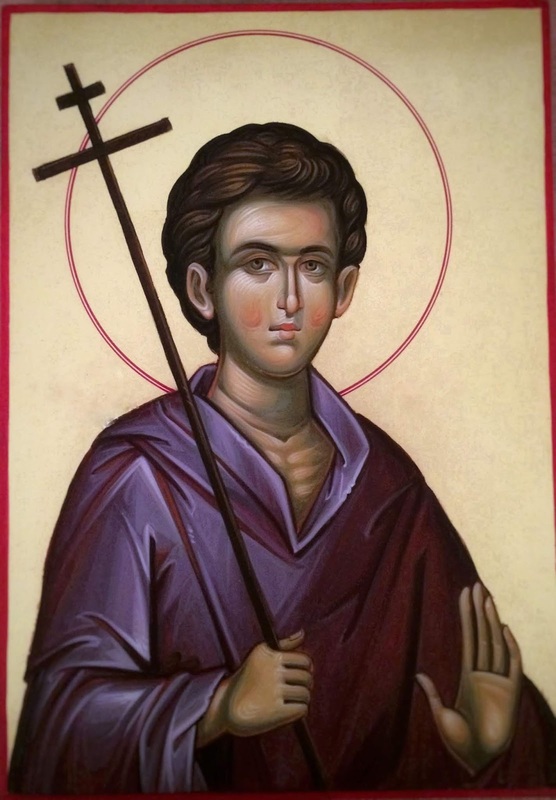 Clothed as in purple and fine linen with the blood of your Martyrs throughout the world, your Church cries out to you through them, Christ God: Send down your pity on your people; give peace to your commonwealth, and to our souls your great mercy. As first fruits of nature, Lord, creation’s Planter, the world offers you, the god-bearing Martyrs; at their intercessions preserve your Church in profound peace, through the Mother of God, O most merciful. Those who bore witness in all the earth and made their home in heaven, those who imitated the sufferings of Christ and who take away our passions, are gathered here today, revealing the Church of the firstborn, who bears the type of the one above, and which cries out to Christ: You are my God; keep me through the Mother of God, O most merciful. The Synaxarion from the Menaion, then the following. On this day, the Sunday after Pentecost, we celebrate the feast of all the Saints from throughout the inhabited world, in Asia, Libya and Europe, in North and South. If any would, let them now list them all. Our most godlike Fathers decreed that we should celebrate the present feast after the descent of the All-holy Spirit, as showing in a certain way that the coming of the All-holy Spirit acted through the Apostles like this: sanctifying and making wise human beings taken from our mortal clay and, for the completion of that fallen angelic order, restoring them and through Christ sending them to God, some by the witness of martyrdom and blood, others by their virtuous conduct and way of life; and things beyond nature are achieved. 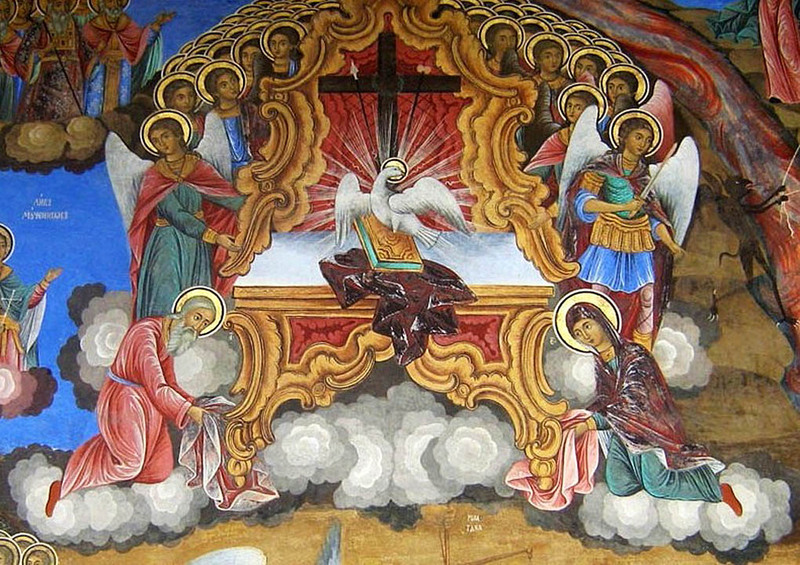 For the Spirit descends in the form of fire, whose natural momentum is upwards; while dust, whose natural momentum is downwards, ascends on high, that dust which forms our mortal clay, the flesh added to and made divine by God the Word, which a short time before, had been exalted and taken its seat at the right hand of the Father’s glory. But he now also draws all those who wish, according to the promise, just as God the Word had manifested the works of reconciliation and what was the end, most suitable to its purpose, of his coming to us through flesh and of his dispensation, namely that he brings those who were rejected before to union and friendship with God — human nature offering to God the ungrateful people from the nations like first fruits —those who were outstandingly well-pleasing to him. This is one reason that we celebrate the feast of All Saints. A second reason is because, though many people have been well-pleasing to God, they were through outstanding virtue unknown to humanity by name, or for some human reason or other, but nevertheless have great glory in God’s sight. Or again, because there are many who have lived following Christ in India, Egypt, Arabia. Mesopotamia and Phrygia and in the lands beyond the Black Sea, even as far as the British Isles themselves; in short, in both East and West, but it was not easy to honour them all properly because of their vast numbers, in the way that ecclesiastical custom has been received. And therefore, so that we may attract the help of them all, wherever on earth they were well-pleasing to God, and generally for those who would later become Saints, the most godly Fathers ordained that we should celebrate the feast of All Saints, honouring the earlier and later ones, the unknown and the known — all those in whom the Holy Spirit has dwelt he has made holy. A third reason is this. 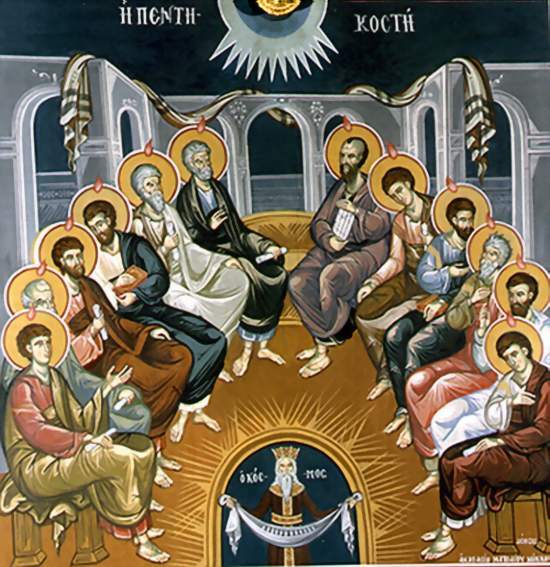 It was necessary for the Saints who are celebrated individually day by day to be gathered together on one day, in order to demonstrate that, as they struggled for the one Christ and all ran the race in the same stadium of virtue, so they were all fittingly crowned as servants of one God and sustained the Church, having filled the world on high. They stir us also to accomplish the same struggle in its different and many forms, to the degree of power that each of us has to press onwards with all eagerness. The most wise Emperor, with the approval of the whole Church, dedicated to all the Saints everywhere in the world the building that had been erected, observing that ‘Since Theophano is a Saint, let her be numbered with the rest. Note that we are celebrating everything that the Holy Spirit, in giving good things, has made holy. I mean the highest and sanctifying Minds, that is to say the Nine Orders; the Ancestors and Patriarchs; the Prophets and sacred Apostles; the Martyrs and Hierarchs; the Priest Martyrs and Ascetic Martyrs; the Ascetics and the Just and all the choirs of holy women and all the other anonymous Saints, with them let there be all who will come afterwards. But before all, in all and with all, the Saint of Saints, the most holy and quite incomparably mightier than the angelic Orders, our Lady and Sovereign, Mary, Ever-Virgin. At the prayers of your all-pure Mother, Christ God, and of all your Saints from every age, have mercy and save us, for you alone are good and love mankind. Amen. I. A couple that was married for ten years (a Greek family from Germany) tried many times to have a child, but were unable (even with in vitro fertilization). They heard of St. John the Russian, and came and entreated him to grant them a child. The woman left her wedding ring on the Saint’s relic and returned to Germany. After a few months, they learned that she was pregnant, and she brought into the world a perfectly healthy little girl, who however, had a small hand disability. After churching the child after forty days, they performed surgery, and the doctors saw in astonishment that in the baby’s palm was the wedding ring that the woman had left the Saint!!! II. A bus traveled to St. John the Russian in Evia from afar for a pilgrimage. A woman from the group had terrible pains in her back and planned to go put on the wonderworking belt of the Saint. However, she wasn’t satisfied with this alone. She thought to take it back secretly with her to wear it. She therefore went, put on the belt and the hat of the Saint, and secretly hid the belt under her shirt. After some time they boarded the bus to leave. However, the bus wouldn’t start. It was motionless. It suffered unexplained damage. The driver stopped and looked at the engine, but everything looked okay. However, the trouble was that the bus wasn’t moving forward. After some time, everyone became restless. The woman who was wearing the belt was struck, and raised her shirt, and confessed to taking the belt. They ordered her to quickly go return it from where she took it, and immediately the bus began to move! For the life and numerous miracles of St. John the Russian, see: http://full-of-grace-and-truth.blogspot.com/2009/05/st-john-russian-new-confessor.html. 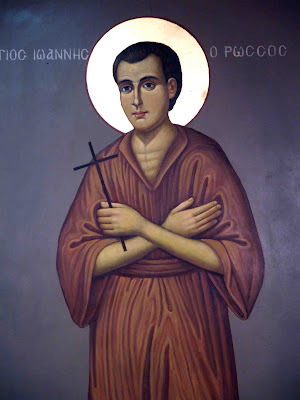 For some additional miracles of the Saint for children and youth, see: http://full-of-grace-and-truth.blogspot.com/2010/02/additional-miracles-of-st-john-russian.html. He that hath called thee from earth unto the heavenly abodes doth even after thy death keep thy body unharmed, O righteous one; for thou wast carried off as a prisoner to Asia, wherein also, O John, thou didst win Christ as thy friend. Wherefore, do thou beseech Him that our souls be saved. The all‐holy mem’ry of * thy splendid contests * on this day is come to us, * and it doth gladden and rejoice * the souls of all them that honour thee * with faith and reverence, O most righteous Father John. How shall I, wretched as I am, praise thy struggles, O righteous Father? How shall I tell of the deep sea of thy tears? For by thine excellence in this life, thou didst attain to the choirs of the Angels; by abstinence, thou, who art truly wise, didst mortify the passions; and by submitting thyself to hardship, thou madest the flesh subject to the spirit and didst put to shame the prince of darkness. Wherefore, as thou standest even now before the Master’s throne, thou intercedest for them that honour thee with faith and rev’rence, O most righteous Father John. On the twenty‐seventh of this month (May) we commemorate our righteous and God‐bearing Father John the Russian, the New Confessor, who was sold as a slave to a certain Hagerene and was taken by him into Asia Minor, into Procopion, a town of Cappadocia, and struggled there in the ascetical life, and reposed in the Lord in the year 1730. As he led away captive the prince of darkness. On the twenty‐seventh John ascended in light. A stable today is the majestic place of our festival; * a slave’s sweat and labours are the dainties cheering our souls; an amazing change * from slavery to kingship, * from earth unto Heaven, inspireth our song of praise. Those who gather in your church, we entreat you to deliver from every visible and invisible enemy which tyrannizes them, for under your fervent care we all take refuge. O Father, drive away the fiery arrows of the enemy from us, through your fervent intercessions to the Trinity, so that having been delivered, we may magnify you. 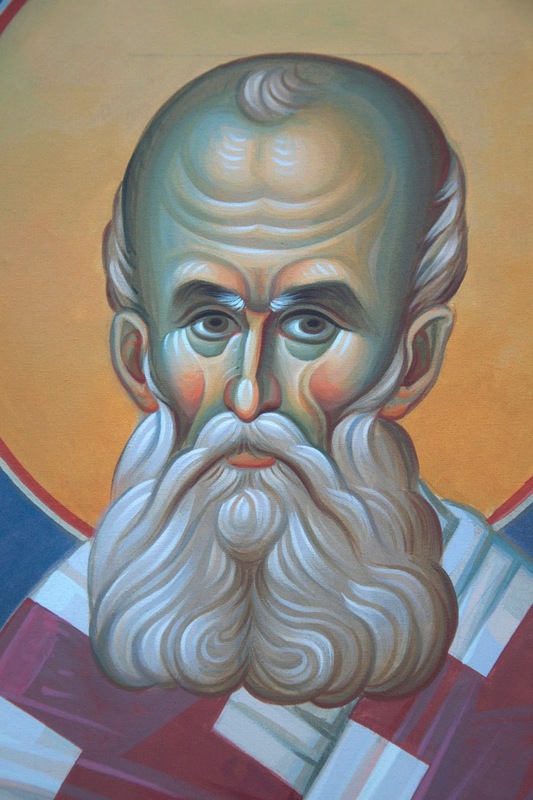 The bright star from Prokopion, that noetically shines on all, the boast of the righteous, and glory of Cappadocia, the divine John we honor in hymns. Entreat for peace from God, calmness of spirits, patience until the end, salvation of souls, to us through your intercessions, to those who praise your wondrous deeds with longing. 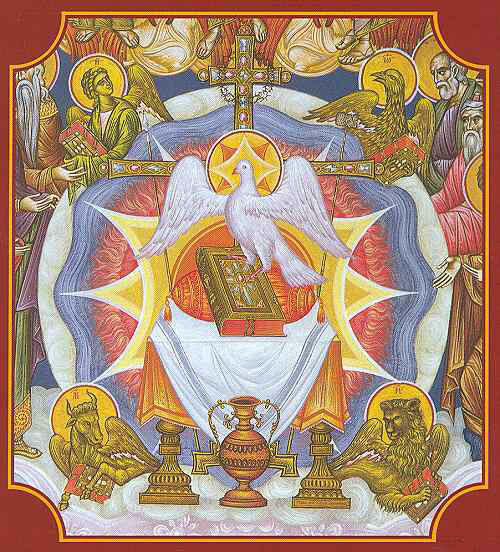 Homily by St. John Maximovitch on Pentecost: "Come, o ye People"
"God is a holy Trinity. 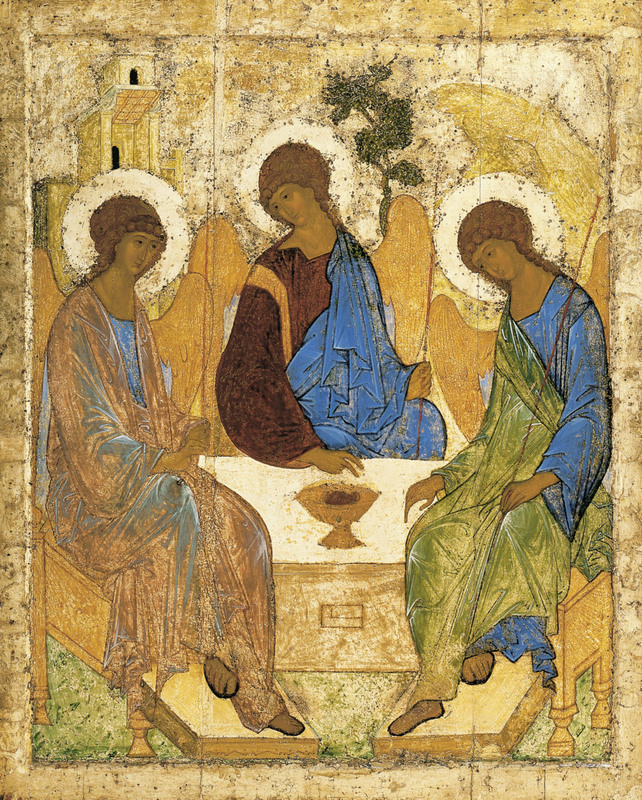 A Trinity consubstantial and indivisible. Consubstantial, that is, one essence, one nature. A Trinity indivisible: the Son has never been divided from the Father, nor the Holy Spirit from the Father or the Son, and never will be divided. Everything is accomplished jointly by the Holy Trinity. At the creation of the world it says in the Bible: And God said, Let there be light: and there was light (Gen. 1:3). What does "said" mean? It means that God the Father created by His Word, by that Word of which the Gospel says, In the beginning was the Word, and the Word was with God, and the Word was God (John 1:1) and which is the Only-begotten Son of God. God the Father created everything by His Word; in other words, He accomplished everything through His Son. The Father does not create anything without the Son, just as the Son does not create anything without the Father, and the Holy Spirit always assists the Father and the Son. It is said in the Bible about the creation of the world: And the Spirit of God moved over the waters (Gen. 1:2). It "moved" over creation, but did not merely move over it — the word in the Hebrew original, which lacks an exact equivalent in Slavonic, signifies "to cover," "to warm," just as a brood-hen sitting on her eggs gives life to them by her warmth, and from them come forth living creatures. Even before His sufferings, Christ promised His Apostles, chosen by Him from among His disciples, to give them the power to loose and to bind — to remit people's sins or to leave them in their sins. After His Resurrection the Lord bestowed this gift of Grace not on any of the Apostles separately, but on all of them together: He established His Church, the repository of that Grace, and united in her all those who believe in Him and love Him. In descending upon the disciples of Christ, according to the promise, the Holy Spirit confirmed them in the faith of Christ and through His Grace poured out upon them the gifts of God. He strengthened them for the preaching and fulfilment in life of Christ's teachings, for the building up of the Church established by Christ and put into action by the Holy Spirit. 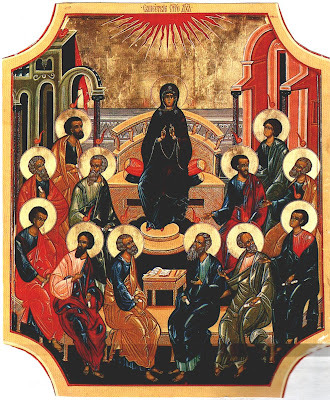 The Church, standing on her foundation on earth and headed by the Son of God seated at the right hand of the Father, is mysteriously guided by the Holy Spirit. She inwardly links together all of her children and unites them with God. Through the Church, God's gifts of Grace are poured out on those striving to follow the way of Christ; they sanctify and fortify all good in them, and cleanse them from sin and every defilement, making them able to become receptacles of the radiance of the glory and power of God. Not only the soul, but also man's body is sanctified and communes with God by partaking of the Body and Blood of Christ, through which he is united with the entire Holy Trinity. Through Divine Grace, with the participation of his own will and effort, man becomes a new creature, a participant in the eternal Kingdom of God. Nature, too, is being prepared for the coming Kingdom of God, for the coming purification by fire of the consequences of man's sin and the curse that lies on her. She receives the first fruits of sanctification through the descent of the Holy Spirit on her at Theophany in the blessing of the waters and in many other Church rites, so that she may later become a new earth and a new heaven. "Come, O ye people, let us worship the Godhead in Three Hypostases: the Son in the Father, with the Holy Spirit; for the Father timelessly begat the Son Who is Co-ever-existing and Coenthroned, and the Holy Spirit was in the Father, glorified together with the Son; One Might, One Essence, One Godhead. In worshipping Whom let us all say: O Holy God, Who madest all things by the Son, through the cooperation of the Holy Spirit; Holy Mighty, through Whom we have known the Father, and through Whom the Holy Spirit came into the world; Holy Immortal, the Comforting Spirit, Who proceedest from the Father, and restest in the Son: O Holy Trinity, glory be to Thee"
(Dogmaticon of Great Vespers of Pentecost)." I. "Let us reason a little about the Festival, that we may keep it spiritually. For different persons have different ways of keeping Festival; but to the worshiper of the Word a discourse seems best; and of discourses, that which is best adapted to the occasion. And of all beautiful things none gives so much joy to the lover of the beautiful, as that the lover of festivals should keep them spiritually. Let us look into the matter thus. The Jew keeps festival as well as we, but only in the letter. For while following after the bodily Law, he has not attained to the spiritual Law. The Greek too keeps festival, but only in the body, and in honor of his own gods and demons, some of whom are creators of passion by their own admission, and others were honored out of passion. VII. If, my friends, you will not acknowledge the Holy Spirit to be uncreated, nor yet eternal; clearly such a state of mind is due to the contrary spirit–forgive me, if in my zeal I speak somewhat over boldly. If, however, you are sound enough to escape this evident impiety, and to place outside of slavery Him Who gives freedom to yourselves, then see for yourselves with the help of the Holy Spirit and of us what follows. XI. He wrought first in the heavenly and angelic powers, and such as are first after God and around God. For from no other source flows their perfection and their brightness, and the difficulty or impossibility of moving them to sin, but from the Holy Spirit. And next, in the Patriarchs and Prophets, of whom the former saw Visions of God, or knew Him, and the latter also foreknew the future, having their master part molded by the Spirit, and being associated with events that were yet future as if present, for such is the power of the Spirit. And next in the Disciples of Christ (for I omit to mention Christ Himself, in Whom He dwelt, not as energizing, but as accompanying His Equal), and that in three ways, as they were able to receive Him, and on three occasions; before Christ was glorified by the Passion, and after He was glorified by the Resurrection; and after His Ascension, or Restoration, or whatever we ought to call it, to Heaven. XVIII. These questions have been examined before by the studious, and perhaps not without occasion; and whatever else any one may contribute at the present day, he will be joined with us. But now it is our duty to dissolve this Assembly, for enough has been said. But the Festival is never to be put an end to; but kept now indeed with our bodies; but a little later on altogether spiritually there, where we shall see the reasons of these things more purely and clearly, in the Word Himself, and God, and our Lord Jesus Christ, the True Festival and Rejoicing of the Saved–to Whom be the glory and the worship, with the Father and the Holy Spirit, now and for ever. Amen." You became a new David in manner. * You received the oil of the kingdom, * as an honor from heaven, upon your head. * The Lord and Logos transcending all essences * anointed you with the Spirit, O glorious one. * Therefore you received the scepter to rule, as one most wise. * And you entreat that we obtain the great mercy. The Maker of the sun and all creation was led once to the Cross. And now to himself He leads you, the shining star, by stars from heaven. And to you first He bestowed imperial power. 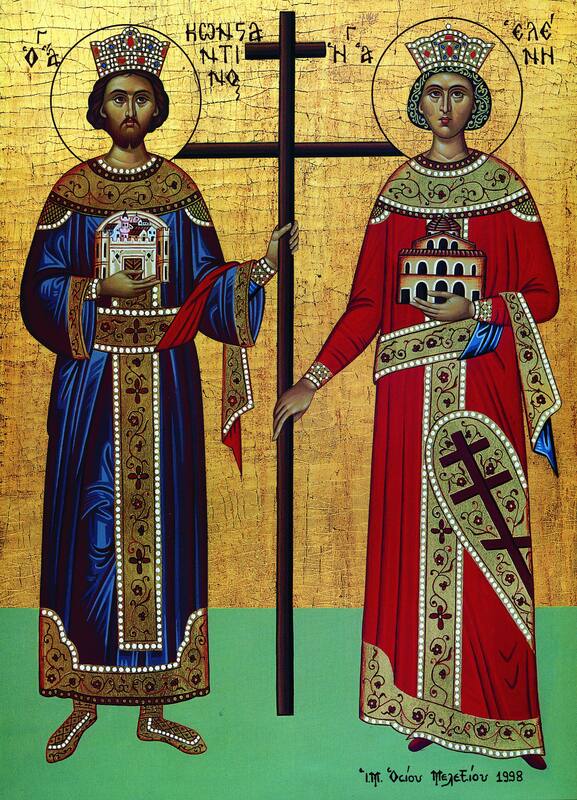 Therefore, O most pious emperor Constantine, we extol you and your mother Helen the godly‐minded. The memorial of Constantine the pious, like perfume that is poured out, has arisen today. He longed for Christ and therefore held the idols in contempt. On earth he erected a temple to the One who was crucified for us; while in heaven he received the crown of hope. Full of wisdom, Constantine, rejoice! 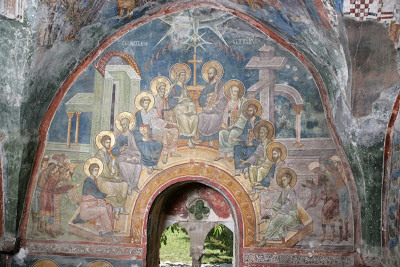 * The well of Orthodox Faith, * that has watered in every age * the entire universe * with its waters most sweet, rejoice! * Glorious root, out of which has burgeoned forth * the fruit that feeds the entire Church of Christ, * you are the pride and joy * of the fathers; O rejoice! You are the first * of all Christian emperors. * Rejoice, believersʹ joy! He who rules over creation all, * O all‐wise Ruler, foresaw * the obedience of your heart, * and through reason captured you * when unreason was ruling you; * and He illumined your thoughts and reasoning * with certain knowledge of Orthodox belief; * glorious Constantine, * to the world He showed you as a shining sun, * radiating brilliant beams * of godly words and deeds. Full of wisdom, Helen, praised by all, when you accepted the Lordʹs * saving teachings, like chosen earth * you abundantly produced * many fruits of your virtuous deeds. * And by displaying a holy way of life * for imitation, you thereby feed our minds. * Therefore we celebrate * your divine memorial, O royal Saint, * festively observing it today with heightened joy. The King of kings and God, who adorns the worthy with abundant gifts, caught you in His net, through the sign of the Cross, like He did to Paul the glorious, O Constantine. He said to you, ʺIn this sign conquer your enemies.ʺ Thus having sought Him, as did your godly‐minded mother, and having found Him for whom you longed, you utterly defeated them. 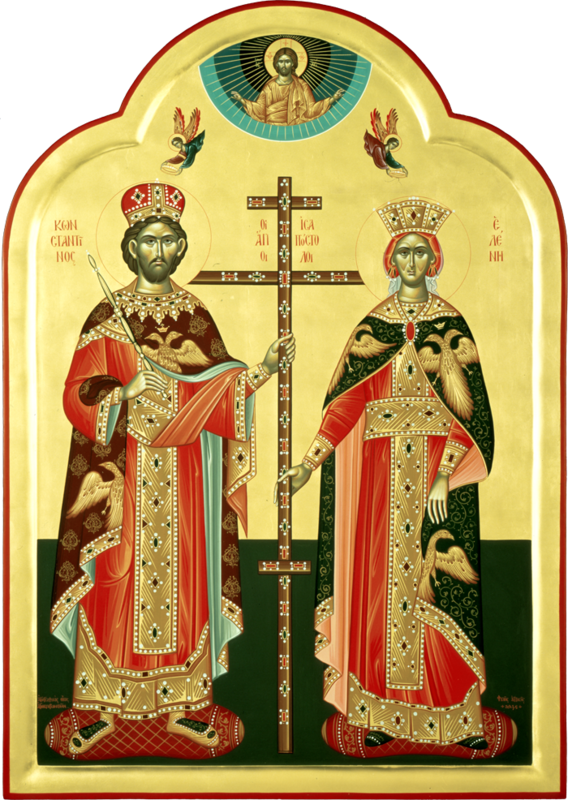 In company with your mother, earnestly pray for Orthodox rulers, and the Christ‐loving armed forces, and all of us who loyally observe your memory, entreating Him who alone loves humanity, to deliver us from all wrath. For the life of Sts. 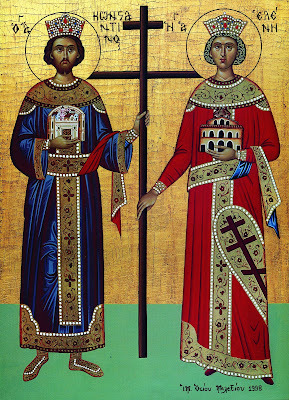 Constantine and Helen, see: http://full-of-grace-and-truth.blogspot.com/2009/05/sts-constantine-and-helen-equal-to.html. "'And my Father will love him, and we will come to him and make our home with him.' My friends, consider the greatness of this solemn feast that commemorates God's coming as a guest into our hearts! If some rich and influential friend were to come to your home, you would promptly put it all in order for fear something there might offend your friend's eyes when he came in. Let all of us then who are preparing our inner homes for God cleanse them of anything our wrongdoing has brought into them." "'And there appeared unto them cloven tongues like as of fire, and it sat upon each of them; and they were all filled with the Holy Spirit' (Acts 2:3-4). They partook of fire, not of burning but of saving fire; of fire which consumes the thorns of sins, but gives luster to the soul. This is now coming upon you also, and that to strip away and consume your sins which are like thorns, and to brighten yet more that precious possession of your souls, and to give you grace; for He gave it then to the Apostles. And He sat upon them in the form of fiery tongues, that they might crown themselves with new and spiritual diadems by fiery tongues upon their heads. A fiery sword barred of old the gates of Paradise; a fiery tongue which brought salvation restored the gift." "Brothers, we shall hymn with praise the tongues of the disciples, because, not with elegant speech, But in divine power they have revived all men. 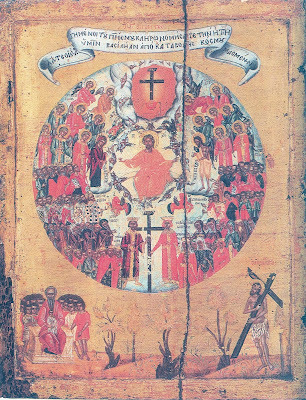 Because they took up His Cross as a reed, So that they might again use words as fishing lines and fish for the world Since they had speech as a sharp fishhook, Since the flesh of the Master of all Has become for them a bait, it has not sought to kill But it attracts to life those who worship and praise The All-Holy Spirit." "But as the old Confusion of tongues was laudable, when men who were of one language in wickedness and impiety, even as some now venture to be, were building the Tower; for by the confusion of their language the unity of their intention was broken up, and their undertaking destroyed; so much more worthy of praise is the present miraculous one. For being poured from One Spirit upon many men, it brings them again into harmony. And there is a diversity of Gifts, which stands in need of yet another Gift to discern which is the best, where all are praiseworthy." The power of the Holy Spirit, which is bestowed upon him who loves God and keeps His commandments, does not appear visibly in the form of fire, nor does it come with a loud sound like a violent wind - for this happened only in the time of the Apostles for the sake of the unbelievers. Instead, it is seen spiritually in the form of spiritual light, and comes with all calm and joy." 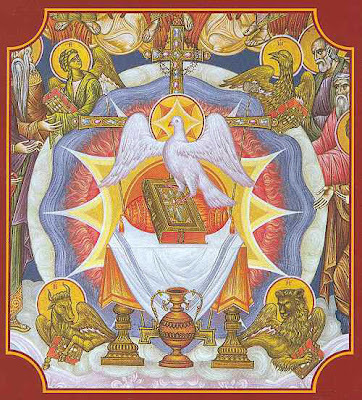 "The holy mystery of the day of the Holy Spirit, Pentecost, is to be understood in the following manner: the spirit of man must be completed and perfected by the Holy Spirit, that is, it must be sanctified, illuminated, and divinized by the Holy Spirit. 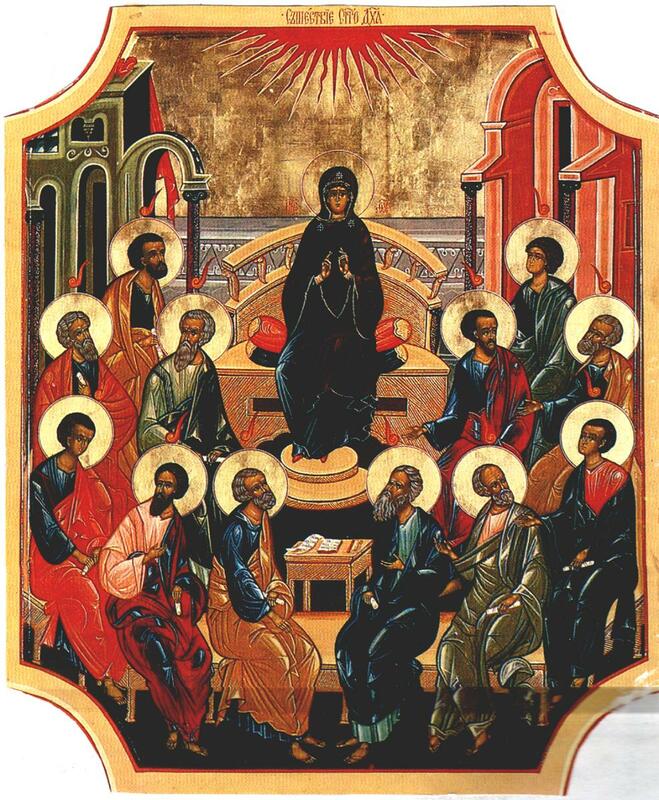 This holy mystery is realized continually in the Church of Christ and because of this the Church is really a continuous Pentecost.... From Holy Pentecost, the day of the Holy Spirit, every God-like soul in the Church of Christ is an incombustible bush which continuously burns and is inflamed with God and has a fiery tongue within it." "The power to bear Mysteries, which the humble man has received, which makes him perfect in every virtue without toil, this is the very power which the blessed apostles received in the form of fire. For its sake the Saviour commanded them not to leave Jerusalem until they should receive power from on high, that is to say, the Paraclete, which, being interpreted, is the Spirit of consolation. And this is the Spirit of divine visions. Concerning this it is said in divine Scripture: 'Mysteries are revealed to the humble' [Ecclus 3:19 ]. The humble are accounted worthy of receiving in themselves this Spirit of revelations Who teaches mysteries." "Was it upon the twelve that it [the Holy Spirit] came? Not so; but upon the hundred and twenty. For Peter would not have quoted to no purpose the testimony of the prophet, saying, 'And it shall come to pass in the last days, saith the Lord God, I will pour out of My Spirit upon all flesh: and your sons and your daughters shall prophesy, and your young men shall see visions, and your old men shall dream dreams' (Joel 2:28). 'And they were all filled with the Holy Spirit.' For, that the effect may not be to frighten only, therefore it is both 'with the Holy Spirit, and with fire. And began to speak with other tongues, as the Spirit gave them utterance' (Mt. 3:11 )." "What is the aim of the incarnate dispensation of God's Word, preached in all the Holy Scriptures but which we, who read them, do not know? The only aim is that, having entered into what is our own, we should participate in what is His. The Son of God has become Son of Man in order to make us, men, sons of God, raising our race by grace to what He is Himself by nature, granting us birth from above through the grace of the Holy Spirit and leading us straightway to the kingdom of heaven, or rather, granting us this kingdom of heaven within us (Luke 17:21), in order that we should not merely be fed by the hope of entering it, but entering into full possession thereof should cry: our 'life is hid with Christ in God' (Col. 3:3). St. Paisius Velichkovsky, “Field Flowers"
"If the Lord has left us ignorant of the ordering of many things in this world, then it means it is not necessary for us to know: we cannot compass all creation with our minds. But the Creator Himself of heaven and earth and every created thing gives us to know Him in the Holy Sprit. St. Macarius the Great, “Spiritual Homilies (Homily 24)"
St. Simeon the New Theologian, "Writings from the Philokalia"
St. Silouan the Athonite, "Wisdom from Mount Athos"
St. Silouan the Athonite, "Wisdom from Mt. Athos"
St. Seraphim of Sarov, "A Wonderful Revelation to the World"
St. Leo the Great, “The Work of the Holy Spirit"
St. John of Kronstadt, "My Life in Christ"